The Supreme Court won't hear Chesapeake case, but ag groups want to revisit WOTUS decision. The U.S. Supreme Court has denied a petition by the American Farm Bureau Federation (AFBF) to review EPA's controversial Chesapeake Bay watershed pollution control plan, leaving in place a lower court order affirming the agency's authority to set runoff controls for the 64,000-square-mile watershed. In related agriculture actions against EPA, a coalition of agriculture and manufacturing groups formally asked the 6th District Court of Appeals to revisit its decision that the federal appeals court is the appropriate venue for hearing the multitude of cases filed against the agency's "waters of the U.S. (WOTUS)" rulemaking. The high court's refusal to hear the AFBF challenge to the Chesapeake Bay pollution control program means seven states in the bay's watershed must impose tough standards on nitrogen and phosphorus runoff. The cost of compliance for the seven states - New York, Pennsylvania, Maryland, Virginia, West Virginia and Delaware - will be in the billions, AFBF said in its court petition. The EPA program was challenged last November, with AFBF asking the Supreme Court to determine whether the agency has the authority under the Clean Water Act (CWA) to set and enforce total maximum daily load (TMDL) nutrient standards for the Bay. Part of the concern is not only the degree of the TMDL standards, but that the Chesapeake program could be used as a model for other watershed actions by EPA. In fact, the lower court ruling upholding agency authority said EPA's action was no different than when it sets thousands of TMDLs across the country. In the WOTUS legal wrangling, the ag groups are asking the three-judge appeals court panel to revisit its odd 1-1-1 February 22 ruling that it is the appropriate venue to hear WOTUS challenges. The industry argued the actions should first be heard in federal district courts and then move to the appellate level. Said AFBF and the National Association of Manufacturers (NAM): "The court's decision raises more questions than it answers. This case cries out for en banc review. There is a 'circuit split,' the question presented is 'an important federal question,' and a 'number of judges on the court' have come to the validity of its own precedent." The two industry groups also said the review is necessary because there is a strong chance the ruling could be overturned. If the court decides to revisit its decision, it will be months before final action. Learn how to relate to Millennials through the proper marketing techniques. You’ve heard it in the halls of trade shows and across social media channels: We have to start marketing to Millennials. But how? We say we don’t understand them, we have a hard time communicating with them, or we don’t know what they want. Well, it’s time to figure it out. Connect with Millennials now or face potential closure in the future. Why? Millennials are the largest generation in U.S. history, numbering more than 80 million—three times the population of the previous generation—and they’re spending $600 billion each year. In 15 years, there will be more Millennials on earth than any other age group. Despite rumors to the contrary, they are very brand loyal, but brands must work harder and smarter to earn their respect and trust. You need them to buy your products. Growers and garden center retailers have become very comfortable claiming that their product quality surpasses their competitors and many believe quality is the main motivator of their customers. The reality is that growers with poor products have already gone out of business. The cream of the crop remains. When asked which factors tend to influence their purchases of branded products, Millennials list value, recommendations from friends, and brand reputation as being more important than quality. An acceptable level of quality is expected, not a bonus, for this generation. There goes your main marketing premise. Can you relate and adapt? Millennials do not relate to brands that market at them from behind closed doors. Today’s most successful brands meet and build relationships with consumers where they live: on social media, on mobile responsive sites, at community events, and are transparent about their brand values. 60 percent of Millennials say that social advertising has the most influence over them in how they perceive a brand and evaluate its relevancy. 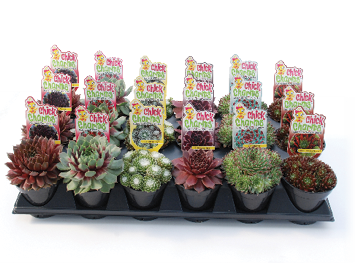 The whimsical new Chick Charms collection of hens and chicks was created with the intention of making plants fun for kids and non-gardeners. Fun sells. As a generation, Millennials are greatly concerned about the state of the environment, having grown up surrounded by the issue of climate change and now the plight of our vital pollinator populations. Brands that authentically share consumers’ concerns and create meaningful products that support the local ecology are winning hands-down with this generation. Companies whose practices fly in the face of consumers’ serious concerns are routinely flogged on the open forum of social media, increasingly to great detriment of their brands. Brands that are achieving the highest levels of success with Millennials share at least one of these five traits: local, authentic, earthy, easy and fun. Here’s how they are doing it. 1. Local. According to consumer market behavior research conducted by Bridget Behe of Michigan State University, most people place a very high value on locally produced products which they perceive to be more environmentally friendly and healthier. In fact, people are willing to pay an average of $.29 more for that locally grown pepper, pumpkin or plant at their local farmer’s market. Conversely, they are willing to pay $1.76 less for imported items. How many garden centers are actively promoting their products as locally grown? 2. Authentic and Relatable. Highly successful brands like Trader Joe’s and Annie’s Annuals & Perennials have done a superb job of developing an authentic brand identity that permeates every part of their business, from the people they hire, to the products they offer in their fun retail stores, and across their print and online marketing strategies. It feels good to shop from these companies that understand and share the values of their Millennial customers. Click here to read more in the March issue of Nursery Management. The experienced greenhouse owner will join Masterblend as a horticultural sales executive. Morris, Ill. -- Masterblend International has announced the addition of Kris Warren to its horticultural products sales team. She will be responsible for business development and sales of Masterblend’s complete line of water-soluble fertilizers, control-release fertilizers, herbicides, pesticides, and other products for professional growers. As a previous owner of a wholesale greenhouse, Warren has unique insight into the challenges faced by today’s grower. Her responsibilities spanned every aspect of the operation from hands-on growing duties to sales and fulfillment of quality horticulture products to customers. This comprehensive involvement in professional growing operations make her a qualified partner to growing professionals seeking solutions to improve results. For the past 30 years, Warren has provided horticultural design, implementation, and maintenance services to a multitude of clients including municipalities, park districts, private businesses, and homes. Her experience includes interaction at every stage of the process from design, planning, communication with and selection of growers, coordinating installation, and site maintenance. Warren holds a degree in Ornamental Horticulture and actively volunteers in local events with Horticultural focus. "Demand for our products is growing and in order to provide an exceptional level of service to our current and potential clients, we needed to expand our sales team," said Mark Jeffries, vice president of Masterblend International. "Ms. Warren brings qualified, real-world experience that she will be able to share with our customers. This credibility made her the clear choice for our organization."